Abstract: In this month’s column, Kerry looks at the friendship between Michael Jackson and Elizabeth Taylor. Despite intense media scrutiny they managed to stay friends until the ends of their lives, including supporting each other through career ups and downs, good times and bad. The media called them “Hollywood’s Odd Couple” – but if we look beyond tabloid gossip, we can glimpse what made their friendship one that was so close and enduring. Hennigan, Kerry. 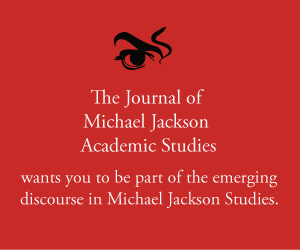 “MJ Studies Today XXVIII (14-04-2018).” The Journal of Michael Jackson Academic Studies 5, no. 3 (2018). http://michaeljacksonstudies.org/mj-studies-today-xxviii/. “Elizabeth, I love you” was accompanied by a spare, stylized performance echoing the golden era of Hollywood musicals – an era that witnessed Taylor’s rise to stardom and produced performers like Fred Astaire and Gene Kelly who had inspired Jackson’s development as an artist. Elizabeth had made her movie debut and become famous at a young age and, like Michael, she had survived childhood fame and an abusive father to become an adult star. Both knew the hunger of the tabloid media for gossip about their respective private lives, including their friendship. They were dubbed by some members of the media as “Hollywood’s Odd Couple.” (3) Stories, rumours and myths of their relationship have continued even after Michael, then Dame Elizabeth (she was made a Dame Commander of the Order of the British Empire in 2000) had passed on. A so-called “tell-all” book called “Elizabeth and Michael: A Love Story” was published in 2016, (4) and a never-screened episode for a UK comedy series called “Urban Myths” was filmed for release in 2017, based on an entirely fictional road trip with Marlon Brando. But the pair had more in common beyond childhood stardom and a surfeit of media attention. Having suffered a back injury after falling from her horse when filming National Velvet when she was 12 years old, Elizabeth Taylor knew what it was like to require pain killers to get through a performance. Sadly, this was to be the case for Jackson, too, during his Dangerous world tour in 1993, due to persistent pain from treatments on the burn to his scalp (suffered back in 1984) and the stress of the first child molestation allegations that were making headlines back in the US at the time. It was Taylor who rushed to Mexico City to see for herself what had caused alarm bells to be rung by some of Jackson’s support team. As she later told the media, she loved Michael like a son, and had taken what she considered to be necessary action to help him. Jackson seems to have trusted Elizabeth Taylor’s advice throughout his adult years. She supported what he did for disadvantaged and sick children who were invited to Neverland, knowing the true nature of Michael Jackson and, also, his innocent love for children and genuine concern for their wellbeing. (4) While a laudable sign of support for her dear friend, it was not, perhaps, wise advice in terms of public perceptions via the lens of a truly caustic media (and a vengeful district attorney). Despite being largely restricted to a wheelchair by now, Taylor attended Jackson’s funeral service, and later escorted his children on a visit to Halloween Horror Night at Universal Studios. Following Taylor’s own death from heart failure in 2011 at age 79, an article in The Hollywood Reporter noted that Jackson’s funeral service at Glendale’s Forest Lawn was one of her final public appearances. (7) It is also where she herself was later laid to rest. After all, friendships – true friendships – invariably outlive youthful infatuations. The emotional ties between Elizabeth Taylor and Michael Jackson endured throughout their respective personal and career peaks and troughs, their good times and bad. They were witnesses to each other’s pain. Considering the media scrutiny they endured, their unfailing loyalty to each other made their relationship, whatever others might try to make of it, a triumph.